It's always sad to be making a sympathy card, but I think this one that I made for a friend who lost her grandmother turned out pretty. 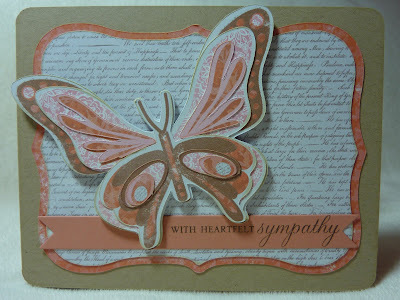 I used Lori's Garden for the butterfly, cut at 3". The topnotes are from Accent Essentials, cut at 3.6" and 3.7", and flood-filled with patterns from Lori's Garden.